Are you a new parent? Do you have an infant that sleeps lightly at times, or needs attention frequently? Perhaps you need to do something as soon as they start to wake up, and seconds are of the essence? That has been the situation for our son, so I decided to put together a baby motion pager system, to alert me as soon as he stirred. If this sounds interesting to you, read on! Our son Henry is almost 5 months old. He is exclusively breast fed, and we have been trying to get him to take a bottle for months now. After trying everything out there (and I do mean everything), we finally figured out that there is a very narrow window of time after he wakes up that he will take a bottle. If the attempt is made after he has woken up too much, he will reject the bottle, and the exercise is as good as over. For me, this can mean a very a long evening - especially if I am caring for him when Mommy is 'out' (A.K.A. I am flying solo and have no other means to feed him). A screaming baby is likely to be my companion for the night. We currently use an audio-only wireless baby monitor. By the time he is up and whimpering/crying, it turns out that the window is basically over (yes, it's that short). To combat this issue, I considered the options. Video monitor - Certainly there are a wide range of camera based systems out there, but the idea of having one more reason to be visually glued to a screen didn't appeal to my wife and I. Also, they jam WiFi and they are expensive. We may end up getting one in the future, but for now we are trying to avoid it. Wake him up for feeding - Yes, it would work, but he usually won't go back to sleep after, and his naps are too short as it is. Finally I decided on a PIR (passive infrared) motion sensor, which would be capable of sending some kind of notification (like an SMS message) when Henry is moving. The implementation would also be very straightforward, as we run a system called Misterhouse, along with X10 devices. X10 is a home control system incorporating a combination of wireless and powerline communications to do things such as turn lights on and off, and other things. 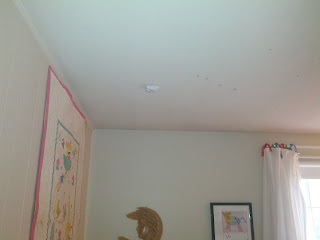 The X10 Infrared Motion Sensor is mounted to the ceiling, directly over Henry's crib. With help from Misterhouse, I was fairly easily able to write a Perl script to send out an SMS page (when activated) whenever the motion sensor detects motion in the baby's crib. No more of this: "Darn, what time did baby go to sleep? What time did he wake up?" Misterhouse keeps a log of all the motion sensor output, so figuring out what time he actually fell asleep down to the minute is trivial. (Note: it's well within the the realm of possibilities to have an automatic sleep timer activated when motion is stopped, which would provide an early warning 10 minutes before his regular nap interval has lapsed). Certainly the possibilities are many, if someone wanted to package this up into a commercial offering. Anyone have some venture capital? Only half-joking.